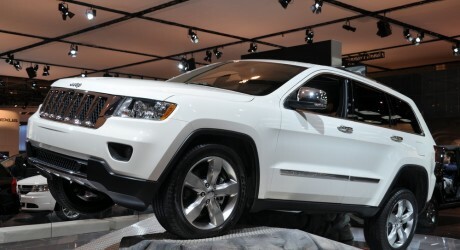 Jeep, a subsidiary of Chrysler LLC, is launching two new versions of the Grand Cherokee SRT8 model for the 2013 model year. The automaker is adding two new appearance packages for the 2013 model year, bright white ‘Alpine’ and brilliant black ‘Vapor’. The vehicle has the Grand Cherokee SRT8′s standard low stance, wide fender flares and new bumpers. The special edition models will include a Jeep hood badge, Grand Cherokee door badges, front grille surround, rear light bar and step pad, all finished in gloss black. Both models will be offered with Black Vapor Chrome versions of the Grand Cherokee SRT8′s standard 20-inch wheels.